This is the fifth post in my series entitled Child's Play 101. I started this series after an influx of posts from bloggers about Pinsecurity. I love Pinterest. I have discovered so many tips and tricks for cooking, housekeeping, and self pampering. I also love that I'm constantly inspired by ideas for my boys. However, not everyone feels the same way about Pinterest. To some it can be overwhelming seeing all the amazing ideas. It can cause parents to hold ourselves against one another in comparison. I fear that when we get discouraged or feel inferior we throw in the towel. 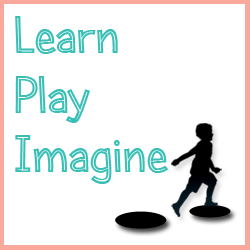 It is my desire to inspire parents to connect with their children on a regular basis in meaningful play. I created this series with the intention of compiling basic yet creative ideas for play on a variety of subjects. Not every idea is going to fit every family, so instead of limiting myself to ideas from my own blog, I've asked a group of blogger friends to share their related posts as well. 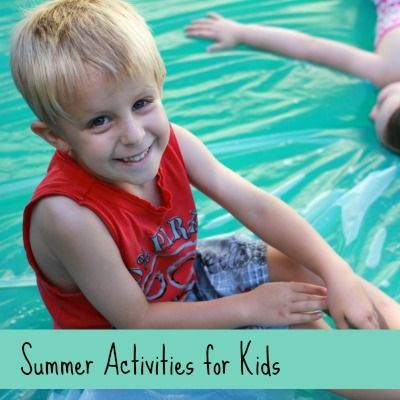 So far we've covered Sensory Bins, Playdough Basics, Messy Play, and Water Exploration. I've got dozens of ideas for future themes, but I chose this one next for a reason. It's controversial. Don't get me wrong. I don't like stirring the pot, and I'm not trying to be controversial. It's more that I want to clear the air. I realize there are some people who will never feel comfortable playing with food. That is okay! We all have to follow our own convictions, and I'm not out to change anyone's mind. What I do hope is to address common reservations and questions about food play and explain the benefits. 1. First of all, many ask why? What is the reason for playing with food? Aren't there enough toys and supplies out there? Why does food need to be played with? There are many, many answers to this, and I'll only touch on a few. A. Touching, tasting, and smelling real food versus toy food allows a child to really explore his world. Yes pretend food can be used for role playing and imaginary play, and there is definitely a place for that. However, when a child is able to explore the different textures and looks of actual food, he is able to really take it in. I wrote more on this in my initial Child's Play post about Sensory Bins. B. I say it over and over, and I'll say it again now. Children are multisensory learners. When all five senses are stimulated at once, a child is more likely to retain what she is learning. C. Playing with food, if done properly, can be the first step in teaching a child basic kitchen skills. I write about cooking with my boys on a regular basis, because it is very important to me that they are comfortable in the kitchen. If food is made into a strict, no mess experience, children might be turned off from wanting to take part in the preparation. I show them how to be careful while cooking, but I also allow tasting, mixing by (clean) hand, smelling every spice and ingredient as desired. D. To extend the above point about kitchen skills, I also prefer my boys learn math through living experiences rather than by doing worksheets. Where do we use math every single day? In the kitchen. My boys understand concepts that they are not yet cognitively able to grasp on paper, and I believe that comes from being by my side while I cook. 2. A common fear for parents is that allowing children to play with food won't teach proper table manners. I believe the contrary is true. 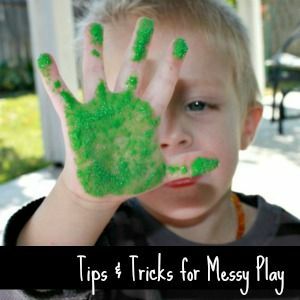 In my Messy Play post I wrote how self control isn't taught by forcing a child to sit still but rather by allowing activity and messes. Who wants your child to smear food all over the dinner table or dump a cup of milk on the floor? I certainly don't. I'd much rather allow food exploration in appropriate settings with established guidelines and boundaries. By allowing food exploration children are able to dig through, smash, sniff, pour, dump etc. and truly discover the characteristics of their food. Research shows that how food is presented in childhood can affect long term eating habits. I want my children to have a healthy relationship with food. 3. Of course we have to cover the ethical question. What about starving children? Why should my children be allowed to play with food while others are left hungry? This is a serious question and one I don't take lightly. I have a few answers. A. We don't waste just to waste. I weigh the food play choices I make before allowing them. Some food play has benefits, some doesn't. Each person has to make the choice where to draw the line based on personal convictions. B. Cost factors greatly into which foods I'll let my children play with. 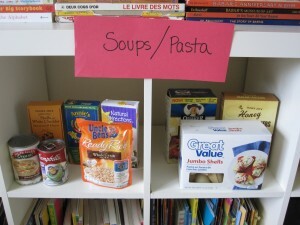 The most common items you will see my boys explore are pasta, rice, lentils, jello and produce. I buy these on sale and use foods such as jello (which is only good for 1-2 play times) sparingly. We spend quite a bit of money on art supplies. The food we use for play and learning costs significantly less. C. Along the same lines as point B. about cost, I have to mention that many of the doughs and paints we love are homemade and consist of edible ingredients. Would you consider store bought Play Doh inappropriate for play? I'm assuming the answer is no, so how about homemade? 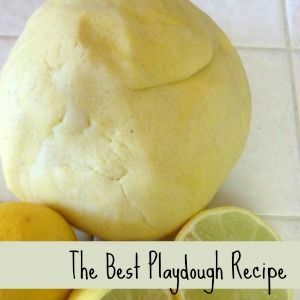 Homemade doughs are generally much cheaper than store bought (not always), and I feel better knowing each ingredient that goes into what my children explore, especially with toddlers and babies who mouth everything. D. An important characteristic I hope to one day see in my boys is concern for world issues. We cannot expect children to care about what they do not know or understand. Deborah of Teach Preschool has some excellent points on this in an article she wrote about food play in preschool. Like I said before, not everyone is going to agree with food play, and that is fine. 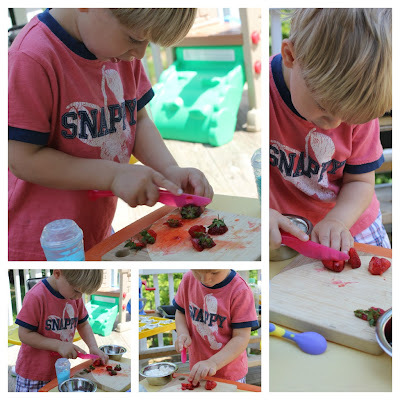 For me, I find that they benefits of food play in early childhood outweigh the reasons to keep it hands off, so with that I'd like to share a list of simple ways to allow your little ones to learn through food play. More than just giving a list of ways to play, I want to also show how you can incorporate food into play while minimizing waste. We are at the point as a family where one box of spaghetti is too much, but half isn't quite enough. Next time we have some leftover I'm going to let the boys paint with it like Smiling Like Sunshine. 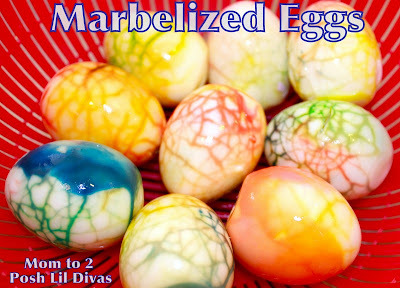 Use eggs for art while keeping them edible like Mom to 2 Posh Lil' Divas. 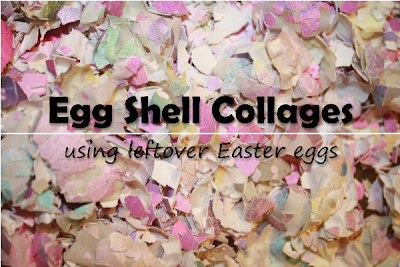 After peeling the shells off your dyed eggs, make some art with the broken shells. 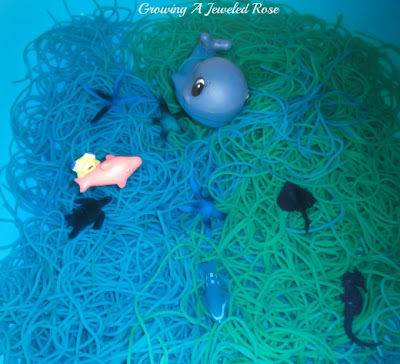 Growing a Jeweled Rose demonstrates extending the life of food used for play by using cooked pasta in a Themed Sensory Bath one day then later that same week outside in a Sensory Pool. I love how The Good Long Road used peas for fine motor skills, languaage arts, early reading and motivation for healthy eating! Also from The Good Long Road here is a post with many wonderful and easy suggestions for raisins including making your own from grapes, decorating fun at breakfast, math games, and more! 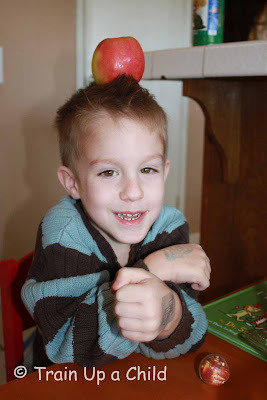 Can you stack apples on your head? We did after reading Dr. Seuss's Ten Apples on Top. We also stacked them like blocks and painted with them, and of course enjoyed them as a healhty snack. 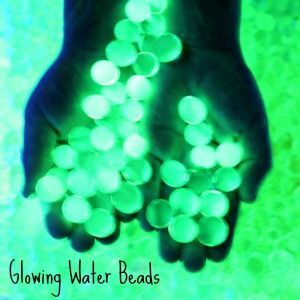 These items make great sensory bins. The sound of them as they are poured and dumped from one container to another delights most young children. Using spoons and cups to transfer them helps with motor skills necessary for writing. 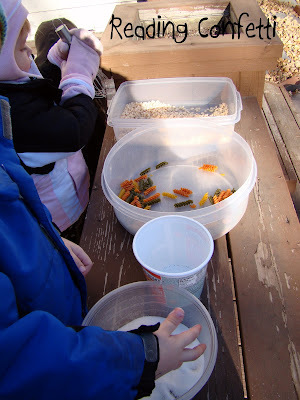 In Lieu of Preschool wrote a wonderful post about beans in a sensory bin along with rules for sensory bins in their house. 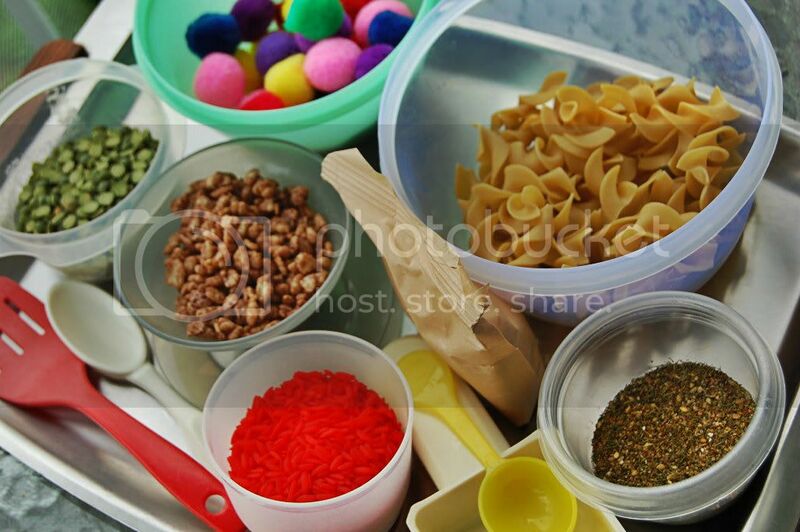 At Carrots are Orange you'll find a super simple, last minute sensory bin with oats and pasta. 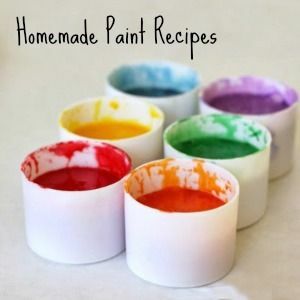 These are my favorite types of ideas, inexpensive and quick! The Outlaw Mom dyed rice for color mixing and making Magic Letters, then used the same batch of rice again and again! The Imagination Tree created a lovely Baking Sensory Bin, perfect for open ended play. 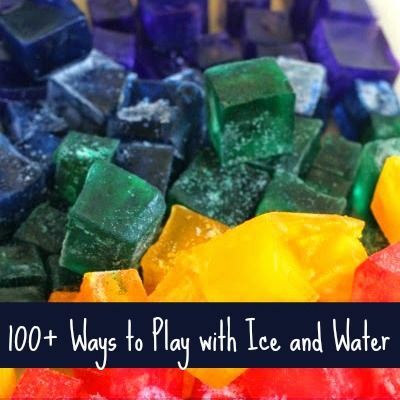 If you can't get past the "waste" aspect of playing with food, incorporate play into cooking. I love how The Golden Gleam played with colors for cookie decorating. 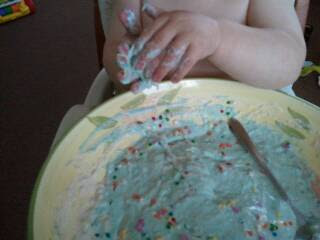 Messy, sensory, creative fun with a sweet treat at the end! Or create a Decorating Station like Learn with Play @ Home. A favorite for my boys is Fishing for Lunch. Reading Confetti shares a way to allow children to "cook" during meal prep time with suggestions for minimizing waste. My boys love to haul dirt, toys, rocks, bugs, and basically anything they get their hands on in their trucks. Next time we have some stale snacks I'm going to take cues from Frogs and Snails and Puppy Dog Tails and set up some construction fun with snacks. Like her young one, my babies want to chew on everything. I might as well provide them with safe items. Famiglia and Seoul raided her pantry for old food and set up a lovely invitation for cooking play. Plan ahead and save scraps like Growing a Jeweled Rose. We LOVE experimenting with different textures for painting, so I'm eager to let the boys paint with various vegetables like Smiling Like Sunshine the next time we have some produce that has seen better days, or perhaps just before a vacation when food would go bad anyway. These Food Creatures from Red Ted Art are so cool! I suddenly feel the need to pull out a variety of foods and let the boys have at it. Build with food. The Outlaw Mom used marshmallows and toothpicks to create sculptures. 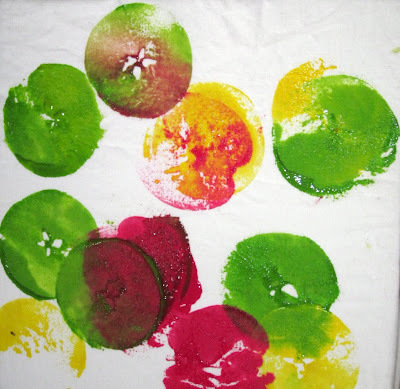 Slice a few apples and let your little one paint with them like Mama's Little Muse. 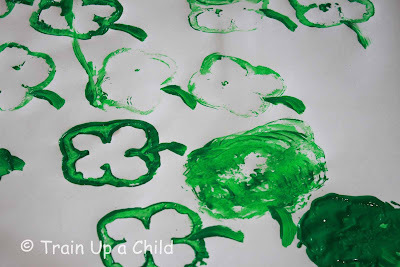 Did you know that a bell pepper can make a shamrock print? We discovered this while painting last St. Patrick's Day. These pumpkin prints from Putti Prapancha are gorgeous and remind me of colorful flowers. 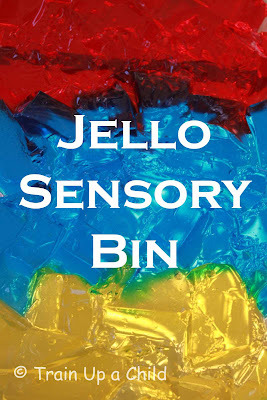 Create a Jello Sensory Bin for some messy, sensory fun. Momma's Fun World set up a wonderful collection of food for her little ones to explore. This isn't "just play". Her children are learning to cut fruit, crack eggs, knead dough, aim cream into serving dishes, and mix all while having a blast. 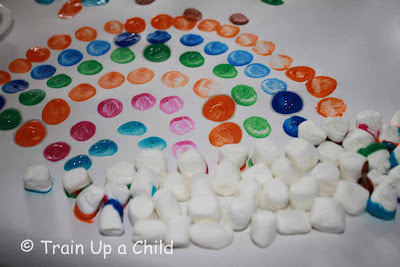 Paint with marshmallows to make Rainbows. One Perfect Day shows us how for less than a dollar (less than a dollar!) she created this colorful, slippery tub of fun! 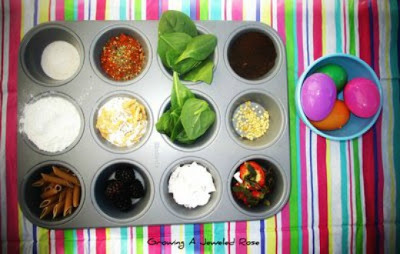 Include babies in sensory play by using edible ingredients. Since babies will bring most anything to their mouths, encourage free exploration by providing them with appropriate supplies. Rainy Day Mum made finger paint for her little one with cornstarch, water and food coloring. Playful Learners combined flour, water, food coloring and sprinkles for some simple, messy fun with food. 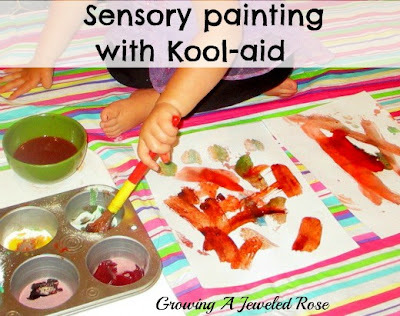 Paint with Kool Aid like Growing a Jeweled Rose. 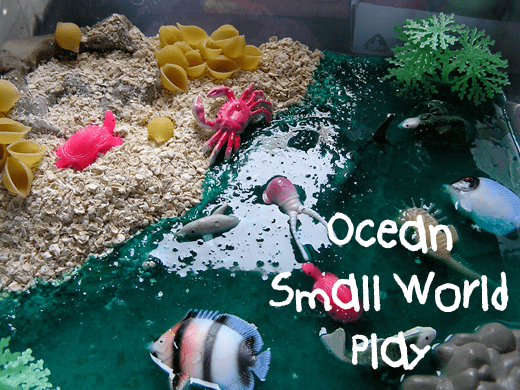 Recreate an Ocean Scene to encourage small world play like Rainy Day Mum. This is seriously too cool not to try. If you aren't comfortable throwing out food after play, set up a pretend Grocery Store using real cans and boxes of food like No Time for Flashcards. Word Play House wrote an inspiring post about giving children creative freedom and turning work into play. 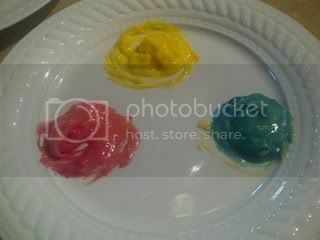 My Buddies and I demonstrates Pudding Painting with fun colors, a must do for toddlers, in my opinion. Make Marshmallow Oatmeal Mud Pies like Momma's Fun World for a sweet treat! 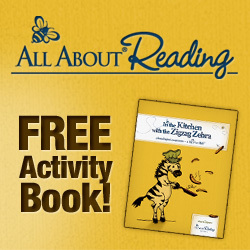 Food can encourage young learners like Fun with Candy from The Outlaw Mom. Not only did she use a recyclable egg container, but she made math fun with just a few simple steps. 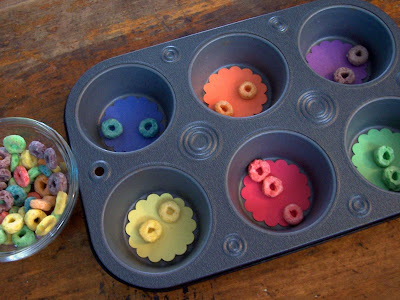 Try color sorting with Fruit Loops like B.Inspired, Mama. 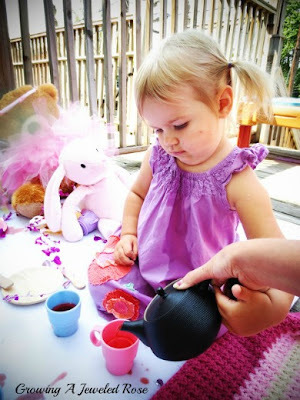 Arrange a Tea Party with real tea like Growing a Jeweled Rose to stimulate your little one's sense of smell while engaging in imaginative play. What are your thoughts on food play? I'd love to hear more suggestions for minimizing waste. Feel free to link any posts you've written about Fun with Food. 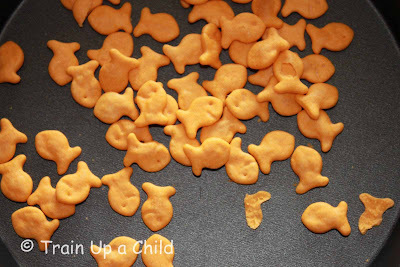 Even a child who won't eat their broccoli has to admit a lot of fun can be had with food! 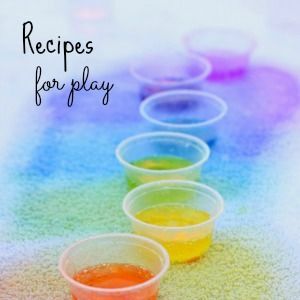 So many lovely food play ideas! What a great listing....love all the fun things listed. Also, thanks for posting some of the fun idea's we have done. What an awesome list! Thanks so much for including us! This IS a great listing!! Love all the fun things listed. And, thanks for including us. Love this list! There are a few that I've not seen before, and I can't wait to try them! Thanks for adding our Outdoor Cooking Creations to the list! Thanks for doing this post! (And for highlighting some of our activities). Playing with food has always been something I've been very mindful of as someone who has worked with low-income children quite a lot. My big difficulty is produce, but you make a good point about produce scraps or pieces that (despite our efforts) might not get eaten before they go bad. I also like that you suggest using expired items. I've also got a container of salt for my little guy to pretend cook and play with that came from a spill we had, and some rice that had bugs in it (I can clean it enough for my play, but not for cooking). What I also do is save the flour that I use for dusting when I make pizza and have it in a container that's for play. I do believe there is a socially conscious way to play with food, and I'm glad you bring up this issue, discussion and ideas. When we consider how toys are made and where they come from (and, probably some art/craft supplies too) and where the potential food items may come from, the food items may actually be the more responsible choice. More great suggestions, thank you! Spills happen more than I care to admit around here with four little ones underfoot, and I love the idea of saving the mistakes for play. I couldn't agree more about how some toys are made and where they come from. Thank you for your thoughts, Jennifer. Absolutely love your ideas! As a nutritionist I think your are so right about the importance of playing with food. It helps children understand foods (in all shapes and forms)and when children are exposed to it they are far more willing to try eating it (so very important with veggies and fruits). Also with the childhood obesity epidemic we have it is important that children have opportunities to see food as more than just eating. That said, my work is with poverty stricken communities so the idea of food waste is hard but we must also teach our children about those without food while we play as well. Hard balance, I know, but everything thing is with parenting! Thank you LeeAnn! I appreciate your kind words and that you took the time to comment. I think you hit the nail on the head-balance! This is something I strive for in every area of my parenting, and I agree it applies to food play 100%. Fun stuff...we did alot of painting with food (the apples, peppers, veggies, etc.) and some of the other stuff listed over the years. Playing with food is fun! Wow Allison, you did an amazing job on this post! 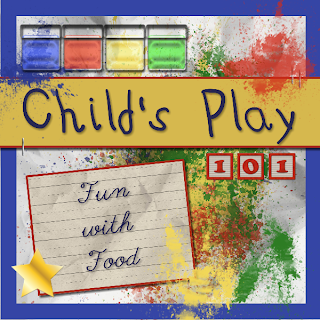 You covered every aspect possible as to why food is an important part of play. I will be sharing this post tomorrow, and am off to pin it now! I had pinned it earlier in the week when I saw it , but it deserves to be circulated as much as possible. I love this series! Thank you, and thank you for your continued ideas! Oh, and thanks so much for including our ideas! It means so much to be to be included in such a great round up of ideas! The best recipes ever came from people not afraid to play with food! I think this is an amazing mass of activites and thanks for sharing at tip toe thru tuesday! Such a great point, Kim! Indeed the best cooks experiment again and again until they get it just right. This is a fabulous post! I love the number of ideas and the variation. And as I have some of the same questions as many parents about manners, waste for food - I really enjoyed your opening and how you answered the many questions that parents do have around playing with your food. Great job! 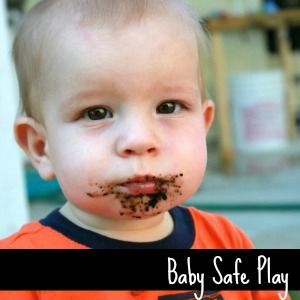 Thank you for a your insightful and thoughtful post about "playing with food"....I recently worked at an organization that only allowed sand or water in their sensory table....completely missing the point that it was supposed to be a sensory experience that allowed children to explore many different senses. From my observations of children who were allowed to explore "food" in a sensory table they seemed less likely to "play" with their food durning meals, unlike the toddlers I worked with who were not given that opportunity and rarely ate well or with any kind of manners. I agree that we need to be mindful of waste so reusing is important as well as cost efficient. thank you again! Price factors significantly into that foods I will let the children get. The most common products you will see the boys discover are pasta, rice, lentils, jello as well as produce.